The table does not match the description, aside from obvious bugs such as the table having scent twice. Also the index still links to the troll on the first page. E: "Did they... did they just endorse the combination of the JSDF and US Army by showing them as two lesbian lolicons moving in together and holding hands and talking about how 'intimate' they were?" B: "Have you forgotten so soon? They're phasing out Don't Ask, Don't Tell." That's because the troll in the first page is the last updtated version, and the one you linked to was a draft that ended up geting buried among the posts. In case of doubt, always trust the index. Also I couldn't stop noticing the monster-friendly campaign you started up. I'll definetely keep a check on that! Hunter Initiate:At 2nd level the Wild Hunt is immune to fatigue, gains resistance to electrecity equal to his HD and resistance to cold and fire equal to half his HD. Master Hunter: At 10th level, the Wild Hunt deals extra damage with all manufactured and natural weapons equal to his Wis modifier. He's also now immune to fatigue. That should've been immunity to exhaustion at level 10. Corrected, thanks for pointing it out! You're welcome, I'm probably going to try and play one in Catty's campaign so I've been going over it with a fine toothed comb. Edit: You should probably also specify that the Selected Prey bonuses are only applicable against that specific target. For the war troll PrC the table mentions 'Brute Warrior', and the text is 'Hard Training'. At least I presume these are meant to be the same. Also looking over your list I notice a horrible shortcoming in that you don't have a Cookie Monster! I can't do a cookie monster if I don't have cookie monster stats to base myself on. But the half-golem has a birthday-cake option. Also fixed War Troll and Wild Hunt typos, thanks for pointing them out one more time! How does the caster level bonus interact with manifesters? Since I don't want tiers 1&2 in my game I will probably houserule it as just a manifester level bonus and nothing else, but I do wonder how it's supposed to work. Ok, let's say you take 8 levels of the mindflayer class and then pick psion 1. You would get manifester level 9, be able to learn 5th level powers (the same as a 9th level psion), and get 14 power points base instead of 2 (72 minus 58, the diference between a 8th level psion and a 9th level psion). Altough I must point out that manifesters have a lot more to gain from improved manifester level than vancian casters have to gain from improved caster level. owenkendel: A little detail you need to take in acount. Your prc can only be taken at 14th level. This means it should actualy be a little stronger than the other kython prcs because you will be higher level than even a full slaughterking. You can notice this on the bigger monster classes, they get stronger abilities as they level up. And personaly, I dislike "generic multiple pieces" monster classes. That's why I went trough so much work of making each dragon type its own class instead of a generic dragon class, or heck, just make this whole project a single class and then keep adding options. Each monster should be unique and the generic aproach both feels unflavourful to me and in the end is harder to review and balance when some combinations end up stronger than other. Also the reason why I didn't allow monster multiclassing between diferent monsters out of the bat. Yeah my main concern is with how they pick up powers since not every psionic class gets new powers known every level. Also many psionic powers scale well with higher manifester level, so only knowing low level powers shouldn't be as big of a problem. It's also a problem how it interacts with half-manifester classes, such as the Divine Mind or some of my own home-brew. Also your method has a problem with prestige classes, say I took mindflayer and entered warmind, I might already be off the scale. The same applies to prestige class casters too though. Which is why I'm thinking of limiting it to a manifester level boost. Yeah my main concern is with how they pick up powers since not every psionic class gets new powers known every level. Also many psionic powers scale well with higher manifester level, so only knowing low level powers shouldn't be as big of a problem. You simply check if the respective psionic class would gain a new power on the respective level-up. It's also a problem how it interacts with half-manifester classes, such as the Divine Mind or some of my own home-brew. You'll just have to pick one base psionic class level before entering the prc. And what will you do about arcane/divine ones? Spells don't get super scaling from just increased caster level. I was going to reduce the prerequisites, and water down the abilities or increase there cost or decrease the amount of mutation points you get. But I think you're right think I'll keep as is and start on something that building on the Kython made me think of. Not sure yet, hopefully it won't come up. I have a question about Deceptively Innocent Form: I want to play a cheshire cat(small sized). My Deceptive Form will be Medium sized. It says that my NATURAL weapons still count as small... but makes no indication of whether I need to wield a small or medium sized weapon(since the form allows me to wield weapons). Since the feat only mentions natural weapons, manufactured weapons fit your new size. I'm on vacation on a village with around just 2 hours of computer availability per day (can't exactly take it to the beach or to night activities), which must be split between keeping check on two online campaigns, making a Xixecal character for Catty's campaign (which includes the above customer suport), satisfying gaming addiction, keeping tabs on my other online projects, and advancing the one-hundred-arm thingy. Currently on 23th level, but progress should go faster now that I entered epic and can make wilder and wilder stuff. Skills:2+int modifier per level, quadruple at firt level, Class skills are: balance, concentration, spot, listen, search, climb, swim, jump, diplomacy, intimidate, knowledge (any). 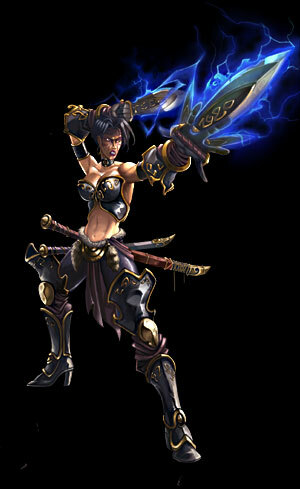 Proficiencies: Simple and Martial weapons, Simple, Medium and Heavy armor. Proto Body: The Hecantoncheires loses all other racial traits and becomes a medium sized outsider with all the related traits (basically darkvision 60 feet). It's a medium sized outsider with base speed of 30 feet. An Hecantoncheires starts with a roughly human shape. In addition, the Hecantoncheires gains a bonus to Nat armor equal to its Con modifier, and is under effect of a permanent NonDetection effect with a Caster Level equal to its HD. Undefined Essence: Hecantoncheires are of the oldest creatures in existence, even before the concept of life was fully formed. This leads to an Hecantoncheires body having a... Very adaptable nature. As a fullround action, the Hecantoncheires can fuse itself with an adjacent helpless creature up to one size category larger or smaller. The fused creature is considered as killed and cannot be brought back untill the Hecantoncheires itself is slain. The Hecantoncheires can then assume the shape of that creature at will as a standard action as the Change Shape ability. In addition, the Hecantoncheires can use one Ex ability from the absorbed creature once, any save DCs becoming 10+1/2 HD+Con mod, and otherwise using the Hecantoncheires own statistics instead of the original creature for calculating any effects . If it was a passive ability, it can activated as a free action and lasts 1 hour. Either way, once the Hecantoncheires has used any ability this way, the absorbed creature is fully turned into the proto material that forms the Hecantoncheires, and its abilities cannot be used by it ever again. The Hecantoncheires cannot have more than one absorbed creature at a time, but once it is turned into proto material, a new one may be absorbed to take its place. Proto Skin:MultiWeapon Fighting: At 2nd level, the Hecantoncheires gains MultiWeapon Fighting as a bonus feat, even if it doesn't meet the prerequisites. Str at levels 2, 5, 8, 10, 11, 13, 14, 17,18,19, 20, 21, 23, 25, 27, 29, 30, and every other Hecantoncheires level. Con at levels 4, 7, 9, 10, 12, 13, 14, 17,18, 19, 20, 22, 24, 26, 28, 30, and every other Hecantoncheires level. For a total of +11 Str and +11 Con at level 20, and +44 Str and +44 Con at level 57. Ancient Senses: At 3rd level, the Hecantoncheires gains Blindsense with a range of 15 feet per HD and telepathy with twice that range. Combined Essence: At 3rd level, the Hecantoncheires can have a second absorbed creature with its Undefined Essence ability. In addition, as a standard action at will, it may become an amalgam of both creatures, with two heads and four arms. It gains +1 racial bonus to Spot and Listen checks for every head it has, but cannot take any more actions per round than normal from them. At 6th level of this class, and every three levels thereafter, the Hecantoncheires may absorb a second creature, up to fourteen arms and seven heads at 18th level. Insane Skill: The unique nature of multiple heads and arms of the Hecantoncheires allows it to use special tactics by using its arms on suportive roles. At 4th level choose one of the following abilities. You must choose how many arms to use in suport at the begginning of your turn, and the bonus lasts 1 round. Suporting arms cannot be used for any other tasks for the duration of the bonus. Steel Storm: Choose one of your arms. For each suporting arm, the chosen arm gains +2 to attack rolls. For every two arms invested on this, you may re-roll a failed attack or miss chance with the chosen arm during this round, including effects like Mirror Image. Ancient Parry: For each suporting arm, you gain +2 bonus to AC. For every 2 arms invested on this, you also gain a 1% miss chance that can't be overcome by any means. Vigilant Blades: For each suporting arm, you can perform one extra attack of oportunity this round. For every two arms invested on this option, the DC of skill checks performed to avoid attacks of oportunity (like concentration and tumble) from creatures threatened by the Hecantoncheires increases by 1. Brutal Wrestler: For each suporting arm, you gain a +2 bonus to grapple and trip checks. If you invested at least 4 arms on this option, you may ignore Freedom of Movement effects when grappling an oponent, and you may also trip normally untripable creatures (like those flying by magic means and those whitout legs), in which case they're unable to move from their position for 1 round. Primordial Combat: For each suporting arm, you gain +2 bonus to bullrushes, disarms and deal an extra 2 damage on sunder atempts. If you invest at least three arms on this ability, you may combine a bullrush, disarm and/or sunder atempt on a single attack. At level 8, the Hecantoncheires learns one extra MultiWeapon Skill. Shield: At 4th level the Hecantoncheires can use Shield 1/day per HD as a SLA. Proto Magic: At 5th level the Hecantoncheires can use Fly and Greater Magic Weapon as SLAs 1/day per HD each. When it uses its Greater Magic Weapon SLA on a weapon wielded by itself, it may choose to make it affect all weapons it is currently wielding, but the effect ends 1 round after the weapon leaves the Hecantoncheires possession. Boulder Throw:Fast healing: At 6th level the Hecantoncheires gains Fast Healing equal to half its HD. Proto Endurace: At 7th level the Hecantoncheires becomes immune to Energy Dragin, Ability Drain and Ability Damage. Growth: At 7th level the Hecantoncheires grows one size category. At level 14 it grows another size category. Each time it grows, the Hecantoncheires base speed increases by 30 feet and its Natural armor increases by 1. Untamed Flesh: At 8th level the Hecantoncheires becomes immune to polymorphing, petrification and any other effects that would alter its form. Unmaking Blow:Greater Insane Skill: At 10th level the Hecantoncheires learns one of the following abilities. At 15th level it learns the other. Boulder Storm: As a fullround action, the Hecantoncheires can rain boulders upon an area. This attack deals (boulder damage including Str bonus)* (half the number of Hecantoncheires arms) damage on an area one size category bigger than the Hecantoncheires itself. Creatures hit by this attack are allowed a Reflex save with DC 10+Bab +Str mod for half damage. If they fail, they're also pinned by the rocks and unable to move from their position by any means for 1 round. Once used, the Hecantoncheires must wait 1d4 rounds before being able to use this again. Weapon Hurricane:As a fullround action, the Hecantoncheires can savagely swing all its weapons at the same time around it. This attack deals half the combined damage of the weapons wielded by the Hecantoncheires on every creature inside the reach of the Hecantoncheires (if the Hecantoncheires is wielding weapons with diferent reaches, use the most common one). A reflex save with DC 10+Bab+Str mod halves this damage again. If a creature fails the reflex save against this ability, the Hecantoncheires may inflict on it any one hit-triggered ability from any weapon used on this attack (like Unmaking Blow), or a basic combat maneuver if the weapon allows it for every 7 HD it has. So for example if the Hecantoncheires used a spiked chain, it could make a trip or disarm atempt on any creature failing their reflex saves. If the Hecantoncheires was 14th level, it could use trip and disarm, or trip/disarm and Unmaking blow. Once used, the Hecantoncheires must wait 1d4 rounds before being able to use this again. Oldest Toughts: At 11th level the Hecantoncheires becomes immune to mind-affecting effects, and it can now choose to use Su abilities instead of Ex abilities with its Undefined Essence ability, including SLAs, but following all other limitations, including one ability per fused creature only. Regeneration: At 12th level the Hecantoncheires gains Regeneration equal to half its HD which is bypassed by Good weapons. This regeneration stacks with the fast healing. True Sight: At 13th level the Hecantoncheires is now under a permanent True Sight ability. Oldest Skin: At 13th level the Hecantoncheires DR is doubled, and its SR increases by 4. Living Pit: At 13th level the Hecantoncheires can fuse itself with creatures bigger than itself. This doesn't change the Hecantoncheires's size, the targets are just compressed as needed into the smaller body, which may get messy. Primal Consume: Superior Multiweapon Fighting:At 16th level, the Hecantoncheires doesn't take any to-hit or damage penalties for attacking with multiple weapons. It adds its full strenght bonus to all arms. Proto Fission: At 16th level the Hecantoncheires can use Fission as the power 1/day, except the duration is 1 hour/level, the duplicate gets copies of all your equipment (but cannot use any limited use abilities from items, only at-will and permanent effects, and said equipment melts into protoplasm should it leave the duplicate's possession), and you don't take any penalty for the duplicate dying. In addition the Hecantoncheires gains an insight bonus to AC equal to 1/3 its HD. Proto Fusion:Ancient Revenge: At 19th level whenever the Hecantoncheires is harmed by an oponent, it may throw it a boulder as a free action as long as it has a free hand. In addition, such is the strenght that the Hecantoncheires now throws its boulders that they count as Adamantine. Unbounded Essence: At 20th level the Hecantoncheires can absorb one more creature at a time as per the Undefined Essence ability. For every extra level on the Hecantoncheires class, the limit on absorbed creatures increases an extra 1 (8 at 20th level, 9 at 21st level, 10 at 22th level, etc). In addition, 1/day the Hecantoncheires can make a passive ability from an absorbed creature last the whole day instead of just 1 minute. Abomination: At 20th level the Hecantoncheires no longer fails saves or attacks in a natural 1, and its DR now can only be bypassed by epic, good and adamantine weapons, and also becomes fully immune to Electrecity. Early Power:Old powers start to fully awaken. At 21th level the Hecantoncheires may use its SLAs any number of times per day. Any limits on Caster Level are removed. Insanity Master: Hecantoncheires have lived on constant struggle since anyone can remember, and the only ones who survived were those willing to devote their existences to merciless combat. At 22nd level, the Hecantoncheires learns all Multiweapon skills it had not yet learned. Any weapon it wields automatically automatically receives its Greater Magic weapon SLA, including thrown boulders. Essence Heart: Despite all its arms and heads, the Hecantoncheires still has a single heart. At 23rd level, the Hecantoncheires can fuse a weapon to it. The Hecantoncheires can grant that weapon's material properties and/or magic enanchments to any weapon it wields, overwriting its original material properties and enanchments. The weapon reverts back to its original stats at the end of the turn it leaves the Hecantoncheires hands. Sacrificial Flesh:While a single arm or head remains, the fight continues. At 24th level, whenever the the Hecantoncheires would be affected by an harmful effect, it may delay it for 1 round by channeling it to one of its arms or heads, making it spontaneously combust and burn. The Hecantoncheires may delay a single effect for multiple rounds (and/or more effects) by sacrificing more limbs and/or heads. The Hecantoncheiresmust absorb new creatures to replace them (regeneration alone won't do), but cannot absorb any more for 1d4+1 rounds after an use of this ability. Greater Insanity Master: Combat breathes out from all the Hecantoncheires pores. At 25th level, Weapon Hurricane and Boulder Storm now deals damage equal to the full combined damage of the Hecantoncheires arms. In addition it may now automatically dispel one magic effect of its choice on the area of the attack and on every creature failing its reflex save against either skill. Brutal Visage: To gaze upon an Hecantoncheires is to gaze upon something that shouldn't exist, yet will fight with all its power to endure, challenging all on its path. At 26th level the Hecantoncheires may enter a Brutal Visage mode as a free action, which lasts for 1 minute per HD. During it, creatures that can view/detect the Hecantoncheires must either attack it from where they stand or spend at least one move action every turn advancing towards the Hecantoncheires at their top speed, and they cannot move away from it by any means, even magic like teleportation or planar travel. If there's more than one Hecantoncheires using this ability on the same area, they advance towards the one with highest HD. Once used the Hecantoncheires must wait 1 hour before using this again, but it can end it earlier and/or make any allies it wishes immune to it. Meteor Smash: It's really incredible the amount of problems a mountain to the face can solve. At 27th level 1/round as a free action even if it isn't its turn, the Hecantoncheires may pull out a massive block of nearby terrain and throw it an oponent in reaction to any action. The boulder automatically hits and the target regardless of defences, which must then make a Fort save with DC 10+1/2 HD+Str mod or fail the action. Either way, they still take 1d6 damage for each free hand of the Hecantoncheires used to throw the terrain block. This isn't a regular boulder attack so it cannot be combined with other bonuses. God Ender: Even the deities struggle when facing the Hecantoncheires. At 28th level it ignores all Salient Divine abilities and planar traits it wishes, including being able to enter personal planes (as long as it gets some tool of planar travel, usually by absorbing a creature able to do so). Creatures killed by any means by the Hecantoncheires cannot be brought back by any means now, even after its own destruction. The Hecantoncheires can now also use Salient Divine abilities from any gods it absorbs instead of an Ex or Su ability as per the Undefined Essence ability. Proto Flashback: Some memories linger more than others. At level 29, 1/day the Hecantoncheires can use one ability from a creature it had absorbed and had already been turned to proto material, but still only one extra use per creature. Unlimited Essence: At 30th level the Hecantoncheires can now bound two more essences. For every Hecantoncheires levels from now on, it can bound three more essences instead of just one more. Martial Purge: Hecantoncheires still remember the time where the strenght and skill of one's arm was what decided your sucess, not how much magic trickery you could stack on you. At 31st level, when using Weapon Hurricane or Boulder Storm, the Hecantoncheires may choose to automatically dispel all effects (including those on creatures) on the area of effect, even normally undispellable ones and epic spells, but all magics on the Hecantoncheires are dispelled as well. Rend Essence: Just as they're undefined, an Hecantoncheires can slash apart the very concept of its oponents. At 32nd level, whenever the Hecantoncheires damages an oponent with one of its weapons (not boulders), it may choose to remove from the oponent a feat, Ex, Su or Ex ability, which takes 1d6 years to come back, if they somehow survive the encounter. The Hecantoncheires automatically gains knowledge of all abilities and feats from any creature it damages with one of its weapons (not boulders). Each oponent cannot be affected by this ability more than once per round. In the case of spellcasting/psionics/maneuvers or similar, instead of fully losing the ability in one go the target instead has the respective ability reduced by 4 levels. So a wizard 32 would cast as a wizard 28 and so on. Multiple Rend Essence stack in this matter. Battle Trough: at 33th level the Hecantoncheires may easily smash trough obstacles with its multiple arms. As part of movement, as a free action, the Hecantoncheires may destroy up to 15 cubic feets of inanimate material with one of his arms, but that arm can't be used for anything else for 1 round. Instead of removing one obstacle, the Hecantoncheires may also instantly kill, absorb or disable for 24 hours (Hecantoncheires choice) one creature in melee reach with a single arm, as long as that creature has a CR 20 lower than the Hecantoncheires HD. Multiweapon Pin: At 34th level the Hecantoncheires has a true forest of arms around it. The squares it threatens count as hard terrain, and any enemy entering (or starting their turn on) them must make a Reflex save with DC 10+1/2 HD+ Str mod or be simply pinned as the grapple option by the Hecantoncheires under the multitude of arms and weapons. The Hecantoncheires doesn't take any penalties grappling for this ability, and this also ignores Freedom of Movement effects. Great Avalanche: At 35th level the Hecantoncheires becomes able to throw boulders one size category bigger. Thanks to this, whenever it throws a boulder, it may choose to fill a 10 cubic square adjacent to the target with debris for each boulder thrown. In the case of Boulder Storm, it may choose to fill up to a 10 feet cube with debris for every free hand used on the attack. Debris placed in one round never interfere with the Hecantoncheires line of sight for other attacks in the same round. If the target ends up fully covered by debris, it must find a way to break out. The debris are of the same material as the boulders thrown. In addition boulder storm can now affect a circle with a radius of 10 feet per HD. The Hecantoncheires never hits allies unwillingly with this. Monstruous Form: As it grows, the Hecantoncheires becomes something beyond words, a moving mass of limbs, heads and flesh. At 36th level while using Brutal Visage, it may as a fullround action move up to its speed and at any time during its movement perform a full attack, weapon hurricane or boulder tempest. Oldest Abomination:Impossible Fusion: At 38th level, if the Hecantoncheires is fused with another creature with its Proto Fusion power, it can now fuse itself with a second creature, specifically overriding Fusion's base limitation. Ancient Flashback: At 39th level as protoflashback, but now 3 extra times. Hundred Handed One: At 40th level the Hecantoncheires full array of arms and heads if a vision beyond any words. Every creature the Hecantoncheires considers an oponent whitin view is Silenced and their wisdom scores are reduced by 2 for every round facing the Hecantoncheires. The Wisdom reduction cannot be recovered by any means, and the Silence lasts for 1d100 days. Only creatures with more CR than the Hecantoncheires has HD get a Will save to resist the Silence and Wisdom reduction, with DC 10+1/2 HD+Con mod. Proto Aegis: At 41th level the Hecantoncheires Shield SLA now blocks all attacks coming from the direction it is facing, and 50% of the attacks coming from the sides. The Hecantoncheires may also change the direction of its Shield as an immediate action. Shred Essence: At 42nd level the Hecantoncheires can now remove 3 abilities from an oponent when it damages them as per the Rend Essence ability. Apocalypse Rock: At 43th level the Hecantoncheires becomes able to throw even bigger rocks. The damage increases two size categories, debris produced can fill up to a 20 feet cube, and boulder storm can now affect a circle area up to 1 mile per HD. The Hecantoncheires never hits allies unwillingly with this. Tri Fission: At 44th level the Hecantoncheires can Fission itself a second time per day as the Proto Fission ability, and have up to two fissioned versions of itself. This overrides Fission's limitation of just one copy. One Hundred Fates: At 45th level the Hecantoncheires can, 1/round, roll a 1d100 when it would have to roll any other dice, and use the result of the d100. Except for calculating HP gained at a level up. A result of 1 or 20 are still treated as natural 1 or natural 20 respectively. Slash the Heavens: At 46th level the Hecantoncheires Fly SLA now grants it a flight speed equal to its base speed if its better, and the Hecantoncheires can instantly change dimensions when it moves whitout need of any extra actions, by literally tearing holes in reality with its hundred arms. It always arrives at the position it wishes with perfect acuraccy, but can only make one such jump for each 10 feet moved. One Hundred Blades Works: At 47th level the Hecantoncheires can as a fullround action perform a special attack where it throws all its wielded weapons with peerless acuraccy and skill. This attack automatically hits up to 100 target the Hecantoncheires can detect whitin its blindsense range regardless of obstacles and defenses. The Hecantoncheires must assign each weapon thrown to a target. The Hecantoncheires must wait 2d4 rounds before using this again. In addition, up to 10 of the weapons used that have any status-inflicting ability may ignore any immunities and resistances, and any DCs from said weapons is increased by an amount equal to the Hecantoncheires HD. Insane Fusion: At 48th level, if the Hecantoncheires is fused with two other creatures with Impossible Fusion, it can now fuse itself with a third creature, specifically overriding Fusion's base limitation. Eons Flashback: At 49th level as protoflashback, but now 7 extra times. All Things Possible:Too Horrible to Die: Nobody really knows what spawned the Hecantoncheires, and nobody knows how to put them to an end. At 51st level whenever the Hecantoncheires would be killed/destroyed/imprisoned/similar, it has 66% chance of simply geting back up with 1d100% of its total HP and arms/head back. Even if the 66% chance fails, the Hecantoncheires is just banished to ancient planes long forgoten where it cannot get out neither can anyone else get in. A miracle/wish from anyone else with CR/level 21 or higher specifically worded to release the Hecantoncheires releases it, in which case the ones releasing the Hecantoncheires can ask it a favor in return. The Hecantoncheires however is not bound in any means to obey the request, altough it usually provides some reasonable measure of help to its releaser as a thanks. This ability specifically overrides abilities that override anti-death abilities. Tear Essence: At 52nd level the Hecantoncheires can now remove 9 abilities from an oponent when it damages them as per the Rend Essence ability. Ragna Rock: At 53th level the Hecantoncheires is literally throwing boulders the size mountains at its oponents. The damage increases four more size categories, debris produced can fill up to a 1000 feet cube, and boulder storm can now affect a circle area up to 10 miles per HD. The Hecantoncheires never hits allies unwillingly with this. Heaven's Fall: Such is the power of the Hecantoncheires that whole pantheons are destroyed under its wrath. At 54th level the Hecantoncheires can automatically move trough any object created by magic means or salient divine abilities, crumbling them whitout slowing down a hinch. Whenever the Hecantoncheires damages a creature that has been created or changed by another trough magic means or salient divine abilities by someone else, the one who did so also takes the damage (including any other harmfull effects). This includes effects like Astral Projection, in which case striking the projection would damage the caster. One Hundred Trinities: As One Hundred Fates, but now 3/round at 55th level. Zelretch's Doom: At 56th level, the Hecantoncheires can strike any number of planar dimensions with each of its attacks. It must have entered the dimensions this turn with its Slash the Heavens ability, and the strikes are performed as if the Hecantoncheires was on the point where it exited the dimension, with the Hecantoncheires only needing to attack once to affect all dimensions entered this turn. This also allows the Hecantoncheires to take an extra round of actions for every normal round it takes. 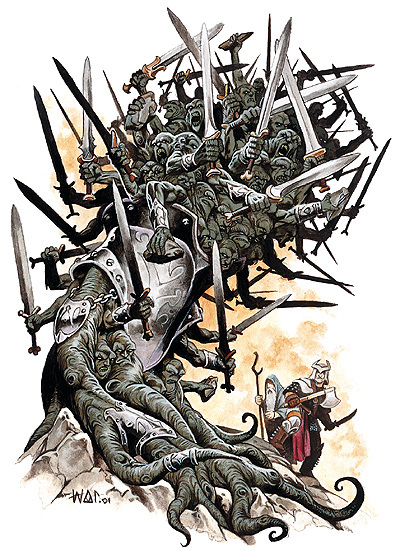 One Hundred Arms, Fifty Heads, One Heart: At 57th level the Hecantoncheires reaches its natural peak as a rough creation of long forgoten demiurges. And it gains some creation abilities of its own. It can now instantly absorb any equipment it touches to its heart (even if in somebody else's possession if the Hecantoncheires can reach it with a melee touch attack) and instantly turn its gold value into extra enanchments to the weapon bounded to it per the Essence Heart ability, at 1/3 the normal cost. It can also change the enanchments as a immediate action, or remove them in the form of coughed jewels with the same value as the invested items as a free action. CR 57 means 57 levels. I believe this class speaks by itself. Enjoy!